The United Nations isn’t letting a good crisis go to waste, having recently endorsed the use of untested, experimental Ebola vaccines being rushed to market as this is typed. Agence France-Presse reports that the vaccines, which are bypassing the normal testing and approval process, should be ready in bulk by early 2015 for use in West Africa.Two vaccines in particular, one manufactured by British drug giant GlaxoSmithKline (GSK) and the other by U.S.-based NewLink Genetics, are being accelerated through clinical trials, according to World Health Organization (WHO) Assistant Director General Marie-Paule Kieny. If all goes as planned, the jabs will be available to health workers as early as November.”If everything goes well, we may be able to begin using some of these vaccines in some of the affected countries at the very beginning of next year,” stated Kieny to the media. 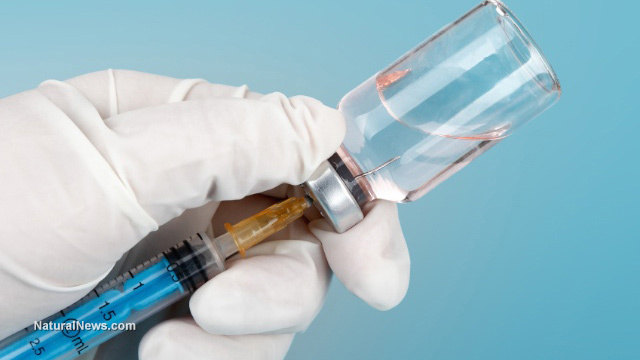 GSK has already initiated human clinical trials on its vaccine in both the U.S. and Great Britain, and trials of NewLink’s variety are set to begin in the U.S. and Germany in the coming weeks, according to Kieny. During these trials, patients will be monitored for adverse events and to see if the shots produce an adequate immune response. The pro-vaccine group Gavi, the Vaccine Alliance, which was started with funding from the Bill & Melinda Gates Foundation, is also on board with the effort. The group pledged in a recent statement to do whatever it can to help speed up the availability of Ebola vaccines determined to be effective. GSK is already planning to have 10,000 of its vaccines available before years’ end, even though human trials have yet to be completed. NewLink is also preemptively declaring the safety of its Ebola vaccines, having recently donated 800 vials, which represent 1,500 doses, to WHO for distribution in the coming months. Several other drug companies are planning to unveil their own experimental Ebola drugs as well, which they plan to test directly on West Africans in the heat of the crisis. Reuters reports that Mapp Biopharmaceutical, Sarepta and Tekmira will all initiate trials in the affected countries as part of a fast-track approval scheme to get the drugs released as quickly as possible. “We are starting to discuss with African sites to see which would be the most suitable to test these new drugs and establish as soon as possible which one gives an advantage for survival to patients,” stated Kieny, emphasizing WHO’s support of the effort. In the meantime, WHO says blood transfusions of human serum taken from Ebola survivors may be helpful in preventing the spread of infection. The treatment was shown to be effective in American physician Richard Sacra, who was given a blood infusion from fellow doctor Kent Brantly. Both men contracted Ebola while working in West Africa. This is the company we are suddenly going to trust with an Ebola vaccine?